This card is a little bit of everything and it all goes. 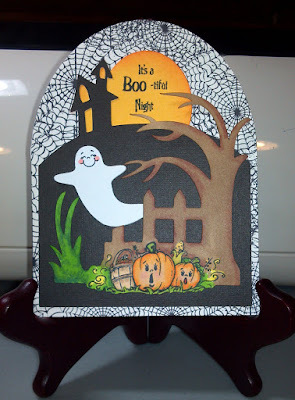 The card itself and the cuts are from SVGCut's Haunted Hemlock Cards kit. The pumpkin stamp is from Punkin' Patch, Autumn Air set, and the Boo-tiful stamp is from My Thoughts Exactly, Fright Night Phrases. The faces on both pumpkins and the ghost are peachy keen face stamps. Background paper is EP Apothecary Add-On digital paper pack, you can get it here, http://www.jessicasprague.com/index.php?page=shop.product_details&flypage=flypage.pbv.tabs.tpl&product_id=1602&category_id=69&keyword=Apothecary&option=com_virtuemart&Itemid=365. I really love this paper line, I bought the other two packs also, just couldn't resist! !